In this two-day hands on course, attendees will learn to properly integrate and maximize their efficiency with their CEREC units. This course is intended for both the beginner and the intermediate user and will benefit both BlueCam and OmniCam users. Proper preparation, imaging, design, milling, glazing, and bonding will be covered in detail. As with any technology, proper implementation is key to success and efficiency. 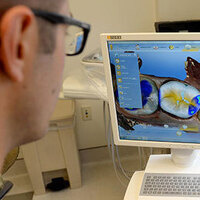 Various techniques will be taught and discussed for quick, and productive implementation of CEREC into any practice. Many pearls, tips and tricks will be covered to make everyday use of CEREC more enjoyable, predictable and stress-free. This course is designed for restorative dentist and assistant looking to learn CEREC or is considering getting a CEREC. This course will benefit anyone with a CEREC looking to improve and maximize their efficiency and daily use. Advanced possibilities with CEREC for bridges and implants. University of the Pacific, Arthur A. Dugoni School of Dentistry would like to acknowledge and thank Dentsply Sirona, Ivoclar, and Patterson Dental for their generous support of this program. This activity is designated for 16 units of continuing education credit. *Course includes continental breakfast and lunch each day. Dr. Brian Toorani is a 1999 graduate from the University of the Pacific, School Of Dentistry. He has devoted most of his time to successfully integrating the latest techniques in dentistry and has mastered the use of his CAD/CAM CEREC machine and his CBCT 3D Scanner since 2010. As a full-time practicing dentist, he has been surgically placing and restoring dental implants since 2002. He is a true supporter of minimally invasive-dentistry and believes in recreating beautiful natural conservative restorations. He is a local and national trainer for Patterson Dental, a lead educational faculty member at Cad-Ray Education, and a true supporter of Guided Implant Surgery. He also holds multiple hands on basic, intermediate and advanced surgical training courses at his office in Huntington Beach, Ca. His smiling nature, gentle touch, and dedication to excellence make him a true leader in the dental community. He is often noted for his passion, enthusiasm and high energy.